This post showcases the first of three tantalising triple-layer cakes I’ve baked recently. Why have I baked so many of them, you ask? Especially when most people are on a new year, clean-eating-boot-camping-green-tea-swigging-booze-craving de-tox. Well, there are two reasons; one, I prefer dirty eating – particularly in January and February, generally the coldest, most depressing months of the year. Secondly, when it comes to cake, I feel there are few things more satisfying than watching a cake slice gently glide through three decadent, fluffy layers of sponge, and lifting up a resplendent, towering triangle to endless ‘ooh’s and ‘aah’s. A triple layer cake should be a perfect symphony of lusciously light layers, moist-making filling, and an irresistible topping that come together to woo anyone within a 2-mile radius. Cheeky. The first in this series is something of a classic, created by a classic – Delia Smith. 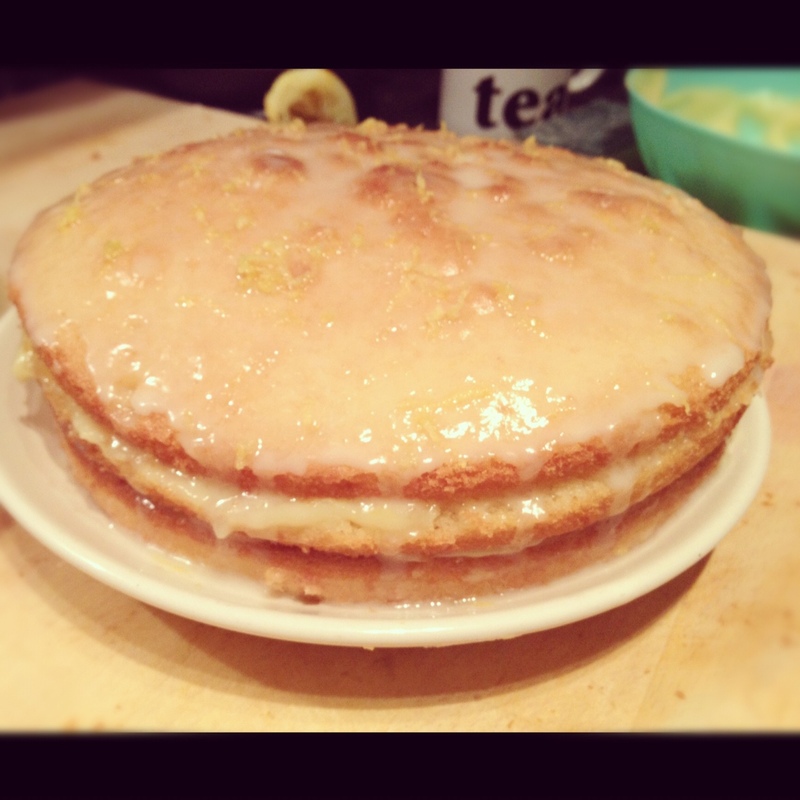 It’s a zesty, light, and simply sublime lemon drizzle cake, sandwiched with homemade lemon curd. 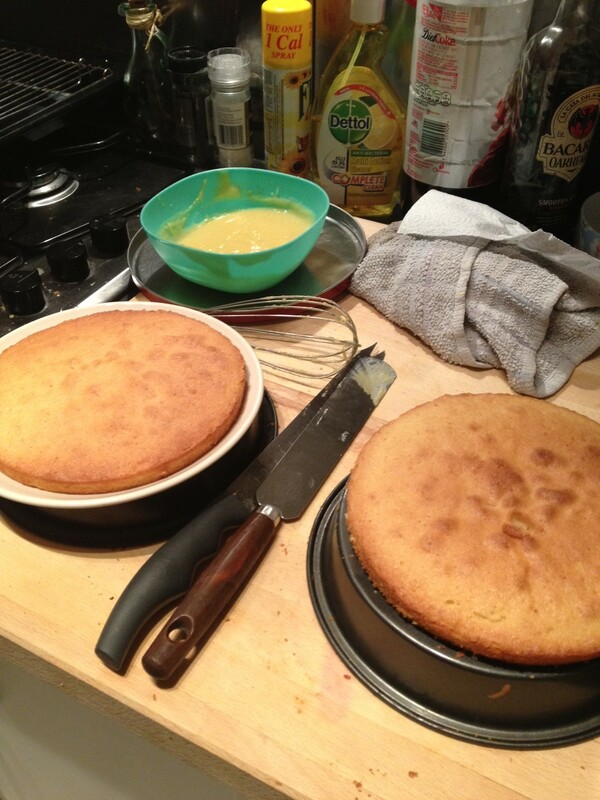 The only thing I’d change would be to make it bigger (with good reason, honest) by upping the quantities – Delia actually cooks this in two tins before slicing them both in two, but I found that I didn’t get as much rise as I’d like to get four good layers. And – obviously – bigger is always better when it comes to cake! I’d probably also change the fact that I made it after getting around 3 hours’ sleep due to being stranded after a night-out when London’s transport system decided it didn’t want anyone in north London to get home. But that’s another story! Measure all the cake ingredients into a mixing bowl and beat – ideally with an electric hand whisk – until you have a smooth, creamy consistency. Divide the mixture evenly between the two tins and bake them on the centre shelf of the oven for about 35 minutes or until the centres feel springy when lightly touched with a little finger. While the cakes are cooking, make the lemon curd. Pop the sugar and grated lemon zest in a bowl, whisk the lemon juice together with the eggs, then pour this over the sugar. Then add the butter cut into little pieces, and place the bowl over a pan of barely simmering water. Stir frequently with a whisk until thickened – about 20 minutes. Remove the cakes from the oven and after about 30 seconds turn them out on to a wire rack. When they are absolutely cold – and not before – carefully cut each one horizontally into two using a sharp serrated knife. Spread the curd thickly to sandwich the sponges together. For the icing, begin by removing the zest from the lemon – it’s best to use a zester to get long, curly strips. Then sift the icing sugar into a bowl and gradually stir in the lemon juice until you have a soft, runny consistency. Allow the icing to stand for 5 minutes before spreading it on top of the cake with a knife, almost to the edges, and don’t worry if it runs a little down the sides of the cake. 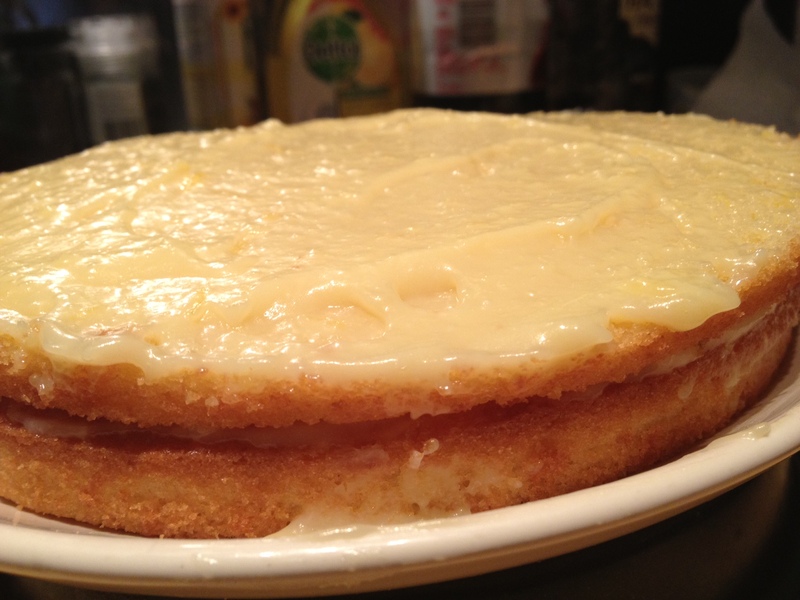 Then scatter the lemon zest over the top and leave it for half an hour for the icing to firm up before serving.